Virgin CEO Richard Branson (Reach for the Skies: Ballooning, Birdmen, and Blasting into Space, 2011, etc.) offers a stirring vision for a “new capitalism” that makes doing good for society a top business priority. A maverick whose Virgin Group companies incorporate socially beneficial initiatives, the author seems to have anticipated the demands (“People Not Profits!”) of Occupy Wall Street, observing that people are becoming more aware of unfairness. “We must change the way we do business,” he writes, going so far as to predict that companies that exist only to maximize profits “will not be around for long.” Branson celebrates many entrepreneurs who have met people’s needs and made a profit, from pioneers like Ben & Jerry and Anita Roddick (founder of The Body Shop) to entrepreneurs around the world. The latter include Gyanesh Pandey, whose Husk Power delivers eco-friendly electricity to Indian families for only $2 per month; Muhammad Yunus, the Bangladesh-born economist and inventor of microfinance; Jane Tewson, who has reinvented British charity with Comic Relief; and Victoria Hale, creator of America’s first nonprofit pharmaceuticals company. “While the industrial age was all about wealth,” writes Branson, “unsustainable growth through depletion of natural resources and delivering profit to your shareholders, this new era, the ‘Age of People,’ is all about shifting the focus to how business can and must deliver benefits to people and the planet—as well as shareholders.” Besides recounting his own efforts to address world issues, the author describes opportunities in health, education and other areas, where fledgling entrepreneurs can help drive social change. 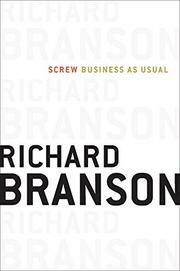 Long known for thinking big, Branson certainly does not disappoint in this heartfelt but over-the-top view of socially engaged business. He serves it up in his engaging, name-dropping style, including a vignette about celebrity-visitor Kate Winslet saving his mother’s life during the fire that destroyed his vacation property in the British Virgin Islands.